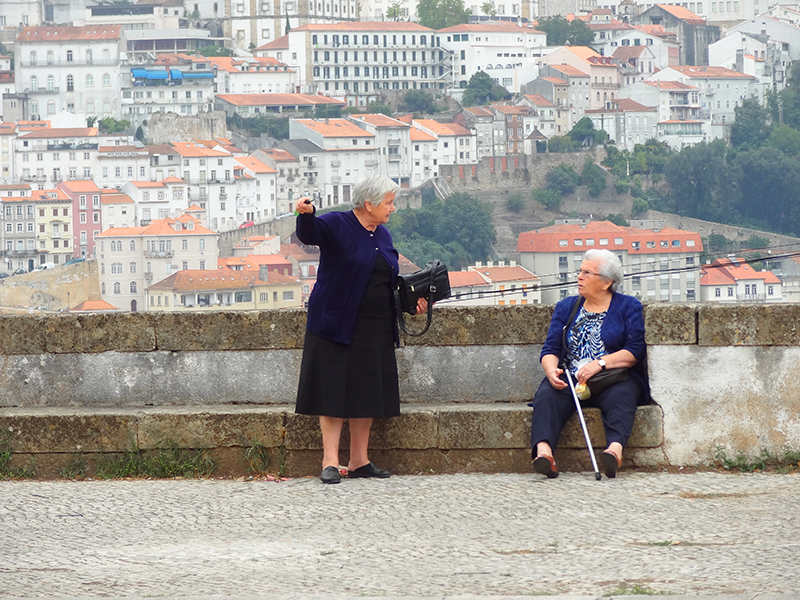 Few travelers are drawn to Coimbra, Portugal since they set their sights only on Lisbon, the beaches of the Algarve, or the wine country about Porto in the north. But Coimbra is home to the University of Coimbra, one of the oldest universities in the world, making it a historic city that’s also quite beautiful. Best yet, it’s only two hours by train from the capital, making it a great day trip from Lisbon. Even on a short visit, you’ll find many things to do in Coimbra. I came for an overnight stay and quickly found myself smitten by its broad pedestrian streets, narrow alleys, and stairways running up and down its hillsides. It’s a great town to stroll about for a few hours. Wanting to make the most of my time after I arrived, I went straight to the local tourist office and asked about the yellow hop-on-hop-off bus I had seen on the way from the station. It was right across the little square next to the office, I was told, and would be leaving in two minutes. I ran out the door, only to see it pull away ahead of schedule. In retrospect, the missed bus was fortuitous since it gave me time to discover a really charming place. 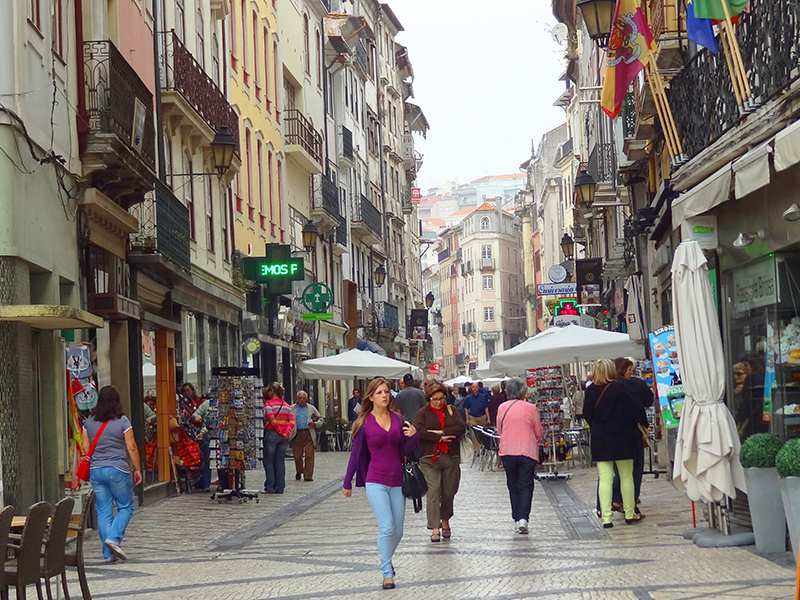 In fact, after only about 20 minutes I found myself realizing there were many things to do in Portugal’s Coimbra, a great little town that was almost a miniature “best of” Lisbon all rolled into one relatively compact area. 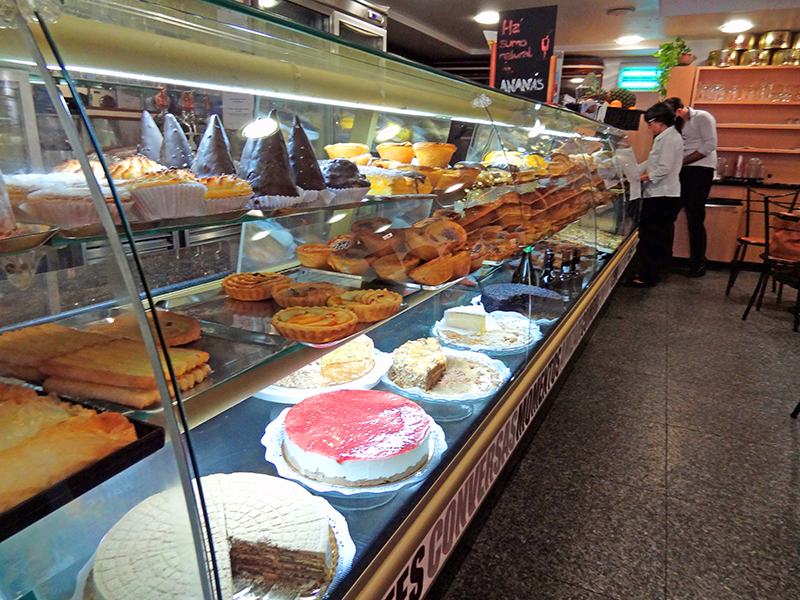 My walk of discovery on my day trip from Lisbon began when I crossed the plaza near the tourist office and found numerous cafes, restaurants and pastry shops, all filled with people enjoying their morning coffee. 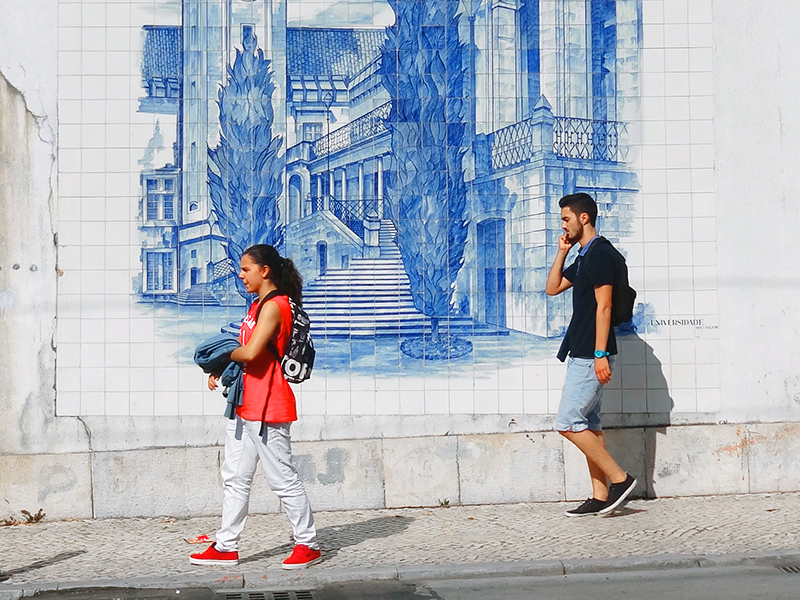 The street was tiled with designs reminiscent of Lisbon’s grand avenues, but without the crowds of tourists. Sizeable old-style street lamps hung from the buildings. I continued on, strolling up little-cobbled lanes absorbing the color and the culture of the neighborhood. I wandered and watched as life went on all around me… a locksmith was making keys in a little store across from a dress shop that was cuddled up next to a hair salon near a small café restaurant. Laundry hung from lines above the street, shopkeepers chatted with shoppers, waiters readied their tables for the lunchtime crush. I became absorbed with it all. 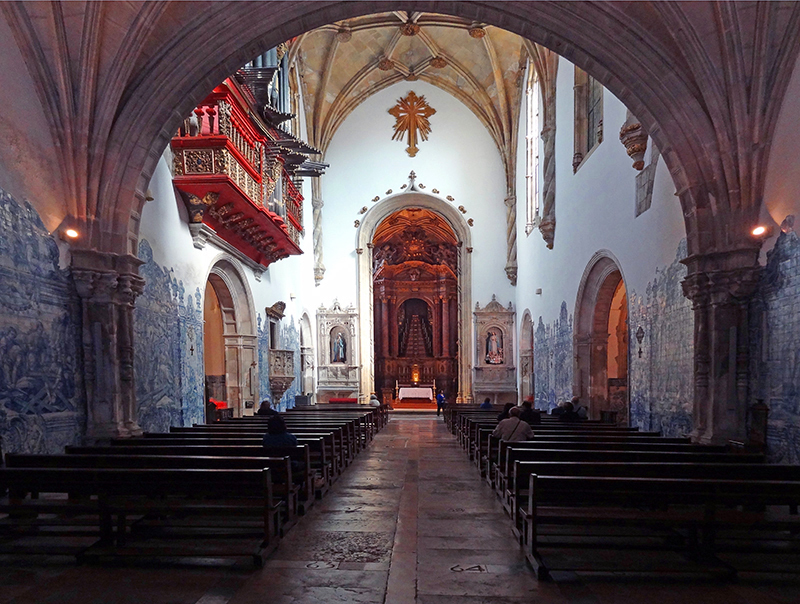 One of the best things to do in Coimbra on a day trip from Lisbon or Porto (only one-hour away by train) is to visit Santa Cruz Monastery, a national monument and the resting place of two of Portugal’s early kings. Inside I found worshipers sitting quietly on ancient pews and a beautiful church with walls covered with blue tiles. I stayed for a few minutes before going back out onto the Praca 8 de Maio, the square in front of the church where a dancing fountain contrasted with the solemnity inside the church. 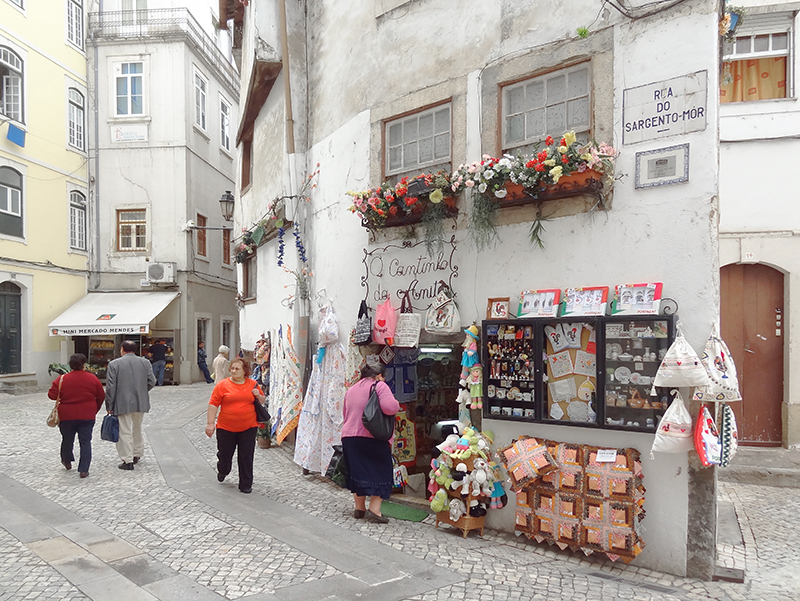 I wandered down the adjacent Rua da Moeda into an area of medieval alleyways not even seven-feet wide and quickly got lost in a warren of little lanes lined with every type of shop imaginable. Inside the shops local women were shopping while outside older men sauntered about, hands behind their backs, watching the day go by. 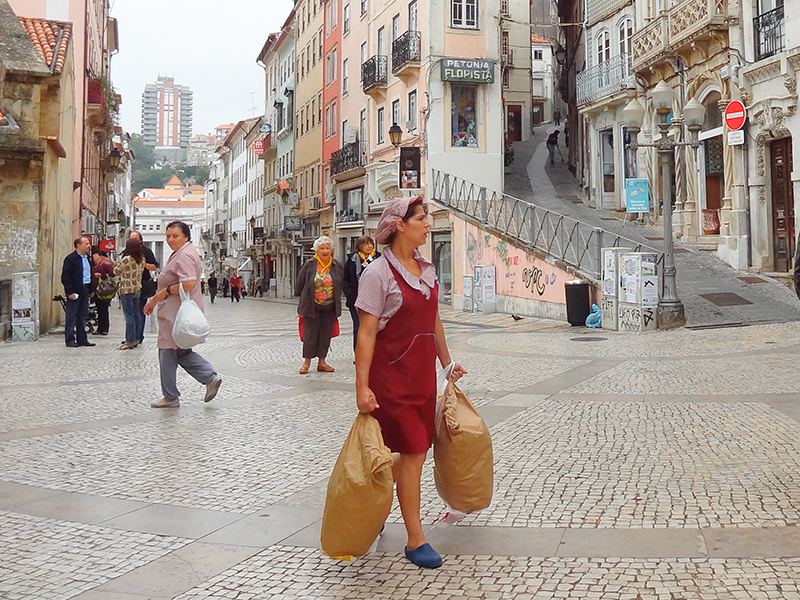 With music from street musicians wafting through the narrow streets I felt I had wandered into another century. Late that afternoon I visited another church after I crossed back over the river and walked up the hill to the Convent of Santa Clara. Like the crowning of Dona Inês de Castro, who was posthumously crowned Queen of Portugal in the 14th century, the convent is another of those anomalies one finds in Portugal. After the last nun died in 1886, the law at the time allowed the government to take over the convent, and they turned it into Army barracks. Five or six years ago, however, the Army moved out, and the church and government are now trying to sell the convent. In the meantime, it remains the final resting place of the former Portuguese Queen St. Isabel who founded the convent and dedicated her life to the poor. I was told her hand is a sacred relic that has survived to this day and can be viewed by the public. The curator in the small museum shop assured me that although the hand is certainly intact, it cannot be viewed since the Bishop only allows it to be seen in years marked by some significant event. One of its last viewings took place in 2012 on the 400th anniversary of the year her body was moved from the coffin in the rear of the church to its current location above the altar. The tiny church itself is beautiful, with an altar and huge wall panels covered with gold leaf. Behind two substantial iron gates in the rear of the church lies her old sarcophagus with a life-size statue of the saint on top of it. Every year on July 8, Isabel’s feast day, 10 local men carry the figure about the city. 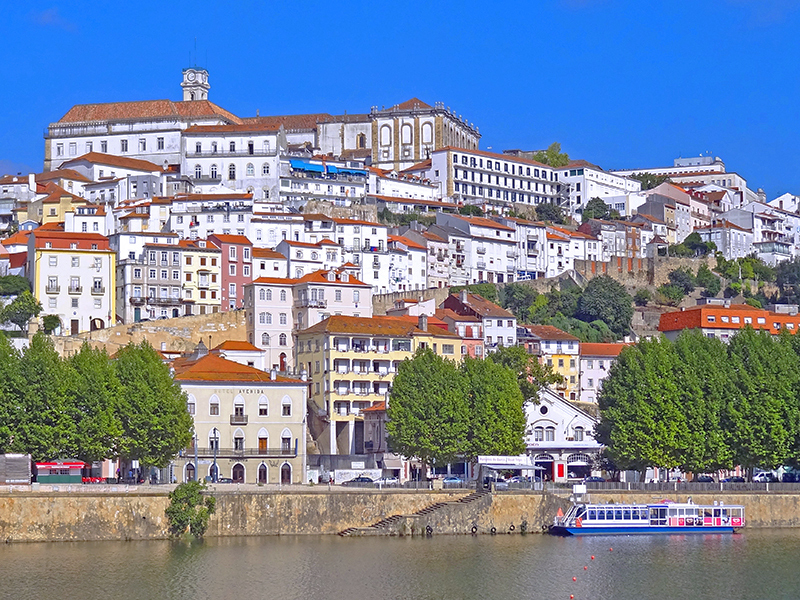 Portugal’s Coimbra has a temperate climate and is visitable any time of year. The coolest month is January when the average high is 56° (13°C), the average low 44° (7°C). As elsewhere in Europe, the warmest months are July through September when the average daytime temperature hovers around 80° (27°C). November through February are the rainiest months. The best time to visit Coimbra is in September and October when the weather is good, the crowds have left, and hotel prices have dropped. If you visit Coimbra on a day trip from Lisbon you’ll obviously have no need for a hotel. But if you plan to stay overnight you’ll find 14 hotels in Coimbra’s city center, ranging from the Hotel Braganca ($42) to the well-regarded Hotel Oslo ($185). There are also many apartments, guesthouses, and B&Bs, as well as six hostels in the $15-35 range scattered about the central city. The price of many of them includes breakfast. You’ll find another half-dozen or so Coimbra hotels outside the city center, including the small luxury Hotel Quinta das Lagrimas ($199), about a 20-minute walk across the river from Coimbra’s Old Town. 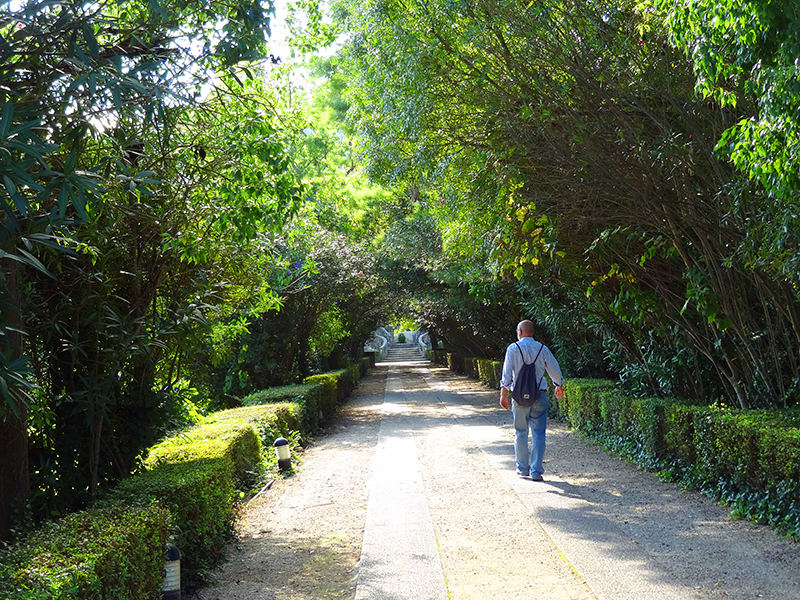 The Quinta das Lagrimas is renowned for its beautiful gardens, where it’s reputed Dona Inês de Castro had her dalliances and reputedly was murdered. July and August are when hotels are the most expensive in Coimbra. March is the least expensive month. Check sites such as Booking.com or TripAdvisor.com for specific prices. 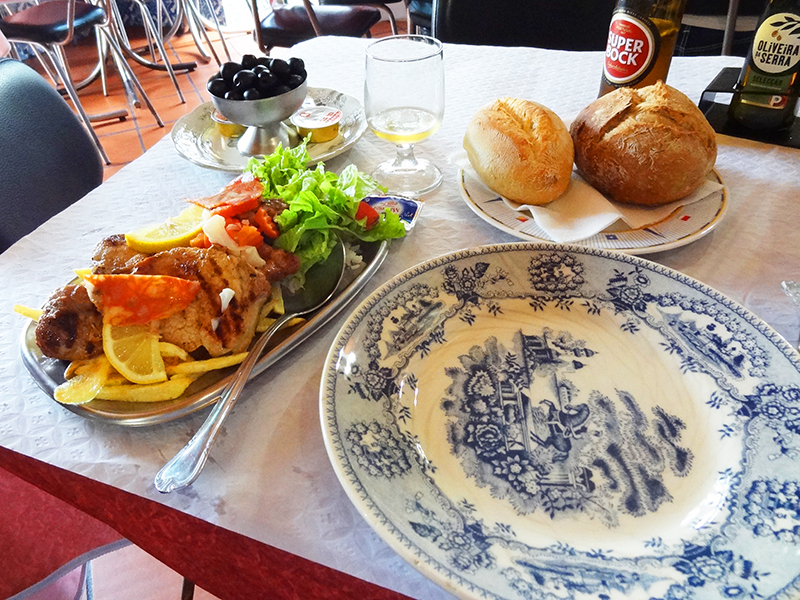 Whether one is visiting Coimbra on a day trip from Lisbon or staying for a few days, you need to eat. Luckily, you’ll find many restaurants, tavernas, and pubs strewn all about the city, ranging from very expensive to downright cheap. One afternoon I found myself in the latter. I had left the convent and was walking back towards the old city when I came across a little taverna, a typical small Portuguese restaurant with tiled walls. The owner was standing outside and motioning for me to come into his little restaurant as another couple exited. 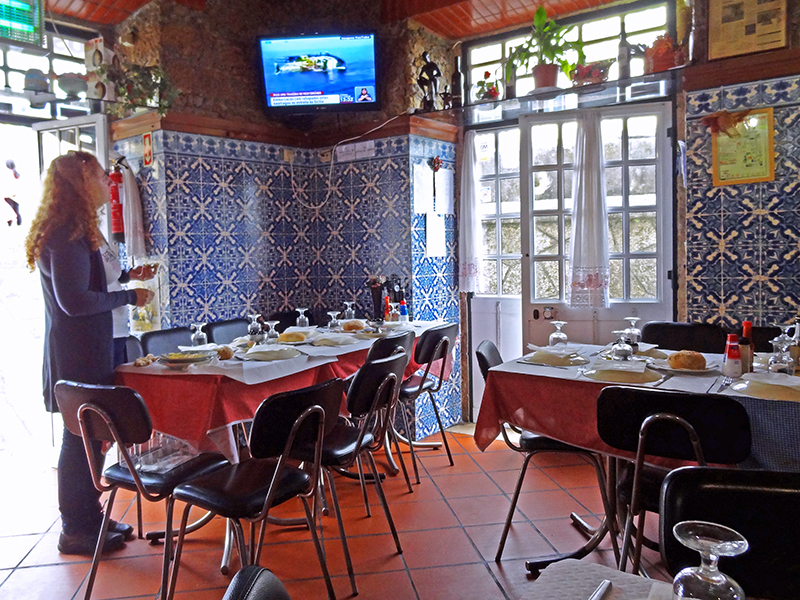 With the thought of having a late lunch, I walked over and found myself in Casa Nobre, a cozy little place barely 15 X 15-foot in size with blue-tiled walls. The menu offered mostly fish and pork, and although it had been translated into several different languages, including English, I wondered whether I was going to get what was described, which was cutlets with rice and chips. After a brief conversation in broken English, he brought the meat out for me to look at, which turned out to be thinly sliced pork cutlets on the bone. The meal (including extra French fries the owner later brought to my table) and a beer, totaled only €10, less than I’d pay elsewhere in Europe. Like most other things I found in this beautiful and atmospheric Coimbra, Portugal, it came as a welcome surprise.